Wonderful gift with your message. Florist Notes: Blushing peach roses and pink larkspur, with more pink, yellow and white blossoms, are sweetly nestled in a handled basket. Snap dragons may be used in place of larkspur. 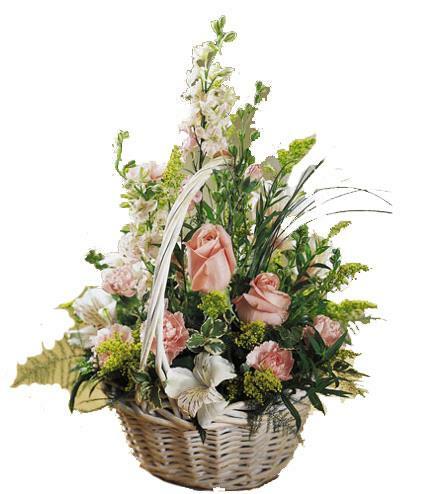 Arrangement Details: Fresh flower basket in pastel colors. Hand made. Hand delivered. Guaranteed to please. Suggested add ons below include a teddy bear, a box of chocolates, and/or some themed helium balloons to suit your occasion.